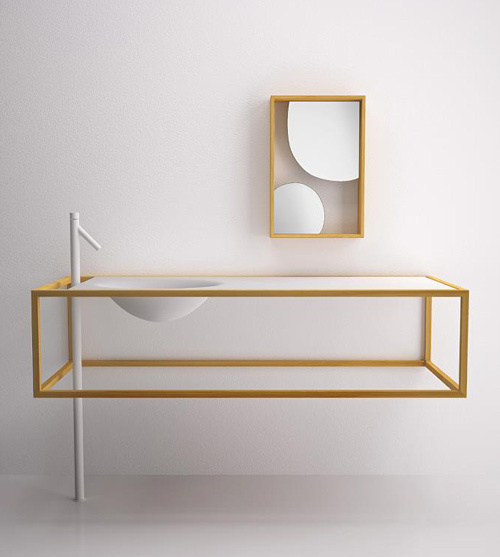 Bisazza Bagno is presenting a new series of bathroom furniture called the Nendo Collection. Designed by Nendo, a Japanese design studio, this collection is simple sophistication at its best. For the first time, Bisazza is using larch wood to define this bathroom collection. Larch wood is known for its warm, golden hue and is the perfect natural material to express the understated elegance of this collection. But it doesn’t end with the material. The Nendo collection is also defined by clean, minimalist lines. 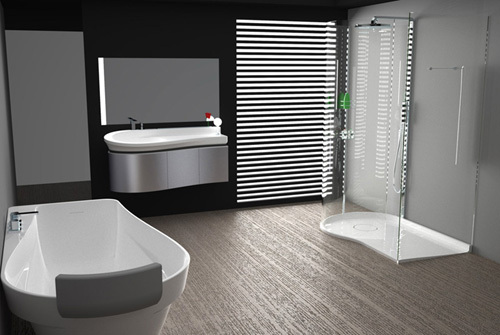 Together, these items create a serene environment for any modern homes contemporary bathroom space. We are completely in love with the tub! Visit Bisazza Bagno to learn more on interior decoration and other home decor products. The cool and modern Wanders period bathroom suite is by Bisazza Bagno, a new division of the Bisazza famous for their luxurious Italian mosaics for your designer homes. 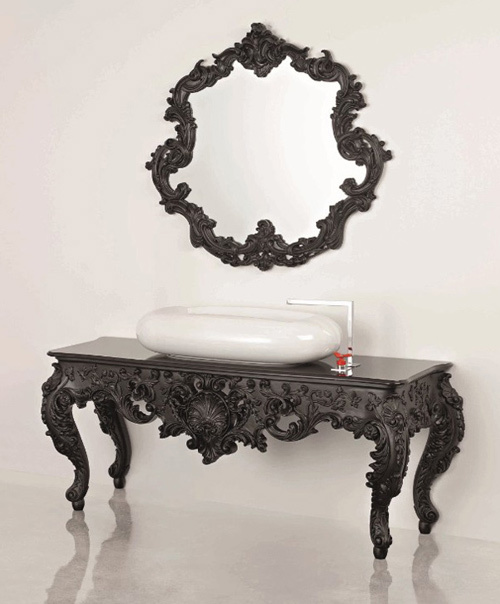 We love the combo and contrast of the period furniture pieces like the vanity and cool funky hardware like the faucets. It makes the suite very unique and separates it from the rest, while adding real dimension to the interior design scheme of the bathroom. The style contrast is quite bold but it totally works, and we love these risky design ideas. 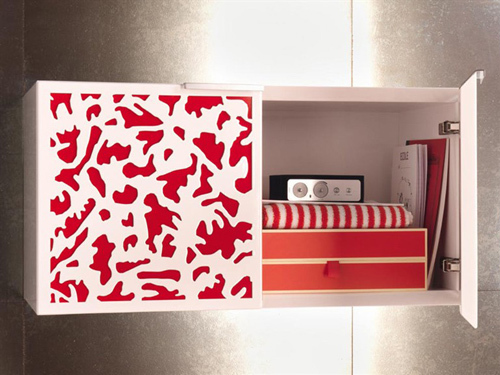 The Wanders Collection, designed by interior designer Marcel Wanders, is the second suite by Bisazza Bagno. It will be unveiled at Cersaie in Bologna in October. To learn more about interior decoration, stop by Bisazza. 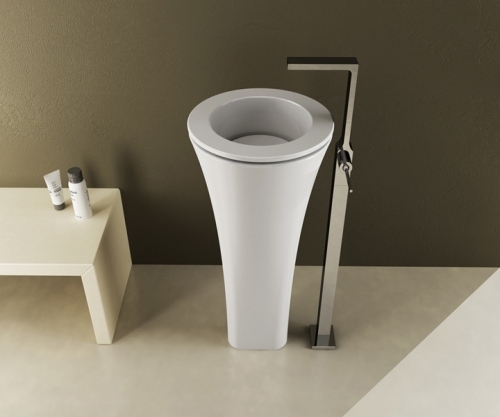 Designed by interior designer Karim Rashid for Cielo, Floot is an exceptionally elegant pedestal wash basin that is sure to add simple sophistication to any modern designer homes contemporary bathroom. 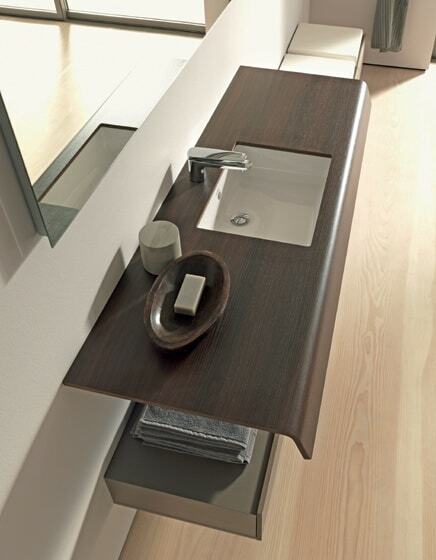 Floot, new generation design ideas for a washbasin that can be installed to your liking – on a pedestal or recessed. 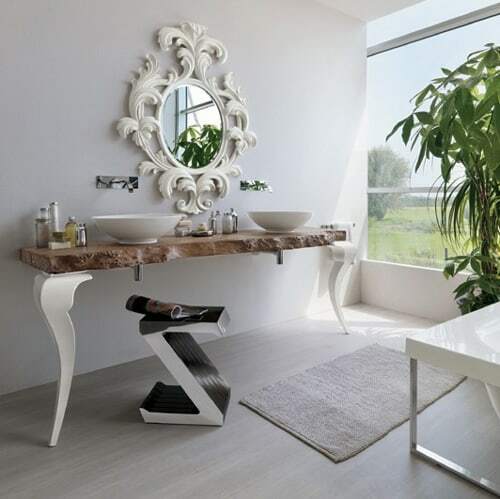 Another amazing design element is that the basin itself can be easily switched out for any other that will be part of the range – all decorated and adorned by Karim Rashid design ideas that suit interior design of your beautiful homes. This way, you can change the look of your bathroom with one simple action. How great would it be to have one for every season? If they will be in any way similar to the work he did on the Tatoo Collection for Cielo, then we are in for a visual feast. This beautiful pedestal sink, with its smooth tapered lines as if formed by the flow of water itself, will be presented at Cersaie 2011. Visit Cielo to find out more about these home decor ideas. By using leading edge laser technology, Regia has created a wonderfully decorative bathroom wall cabinet that belongs to their Batik bathroom furniture collection for your designer homes. The fretwork door is the major attraction of otherwise sleek and straightforward design ideas of the cabinet. While it adds a beautifying aesthetic, the door also reveals a different color behind it for even more impact. This wall cabinet along with the other Batik pieces are designed to allow for many configurations so as to fit any space and easily achieve any look that is desired. 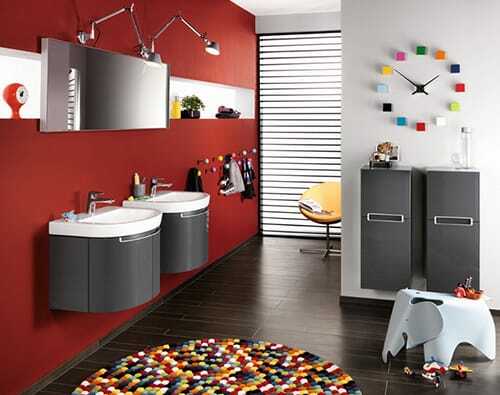 This bathroom furniture collection comes in a variety of vibrant decorative colors. Visit Regia to learn more. Adorned with beautiful amphibian aggressive designs fabricated of Swarovski crystals, the Adolescent Swarovski ablution collection’s bath accessories by Vitruvit are absolutely adorable for the adolescent and not so young. The accumulating includes a toilet, a bidet and a bore which, due to the crystals, animation ablaze in all directions, absolute for brightening up and bringing joy to your bathroom. The Swarovski crystals are artfully activated by duke and are affirmed to aftermost ten years if you chase the appropriate affliction instructions. The alfresco of these fixtures, area the crystals are, should artlessly be wiped with a clammy bolt to ensure durability. 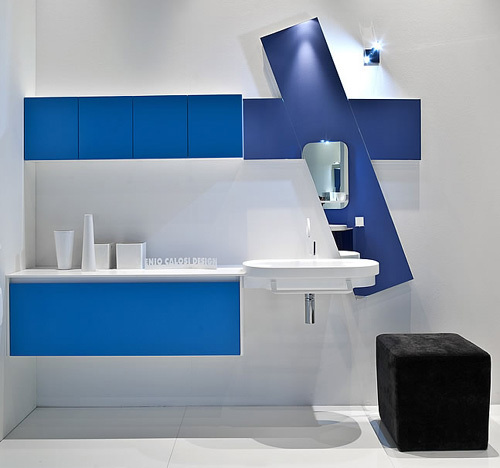 Get more info on these bathroom furnitures for your designer homes at Vitruvit. Villeroy&Boch is advancing aback for annular two with this adventurous bath appliance accumulating – Subway 2.0. So accepted is the Subway line, in fact, that the German bath cast took its absolute apartment (sinks, toilets, battery trays, etc.) and added this fresh appliance aspect – under-sink cabinets with beeline and arced facades, dark lockers with dark doors, accessible shelving, mirrors and assorted accessories. Available in a best of finishes including matte and bright white, petrol blue, bright atramentous and graphite-finish oak. Rounding out the contemporary Subway fixtures, the Subway 2.0 bath accumulating is the absolute finishing touch. More details are available online at Villeroy&Boch. 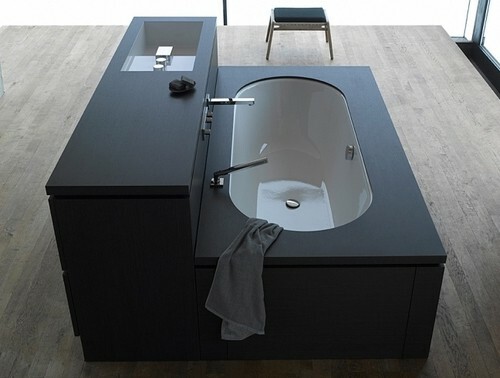 This modular bath appliance by Sieger Architecture for Alape offers a able band-aid to clothing your alone needs. Dubbed “Be Yourself”, this air-conditioned accumulating lets you adapt your apartment to clothing your space, your appearance and your specific needs. Straying from the bath in the acceptable sense, this avant-garde architecture takes a holistic approach, area anniversary allotment complements the others. Ample accumulator is buried abaft adventurous advanced panels, featuring minimalist capacity and clean-faced fronts, topped by an undermount or countertop washbasin. 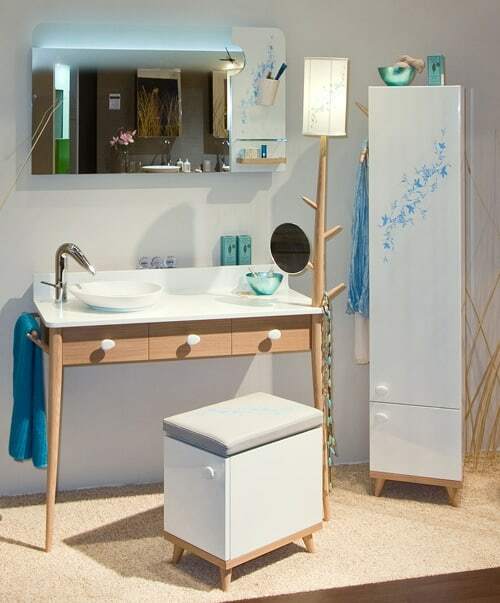 This sink/storage assemblage can be freestanding, or accumulated with the mirror piece, or alike a bathtub unit. The furniture-style lower panels appear in three altered copse finishes and three accustomed bean finishes. The modular bath appliance accumulating includes washbasins, aflame mirrors and washbasins. Check them out online by visiting Alape. 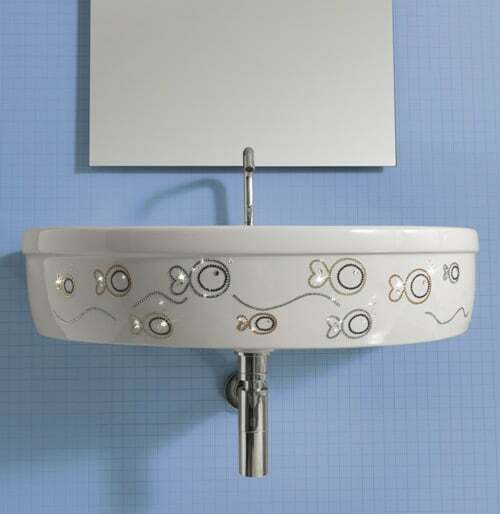 Make a account in the bath with this Epoch bifold washbasin animate by Bizzotto. The textured, accustomed apparent is rugged, giving a different appearance and feel to the furniture, creating an acutely affected vanity unit. A artisan of some 40 years’ standing, Bizzotto has taken its acceptable abilities and transferred them to the abreast age, bearing pieces that are beautiful and individual. The adverse of colors and textures, ablaze and dark, on this Epoch animate distinguishes it from the norm. 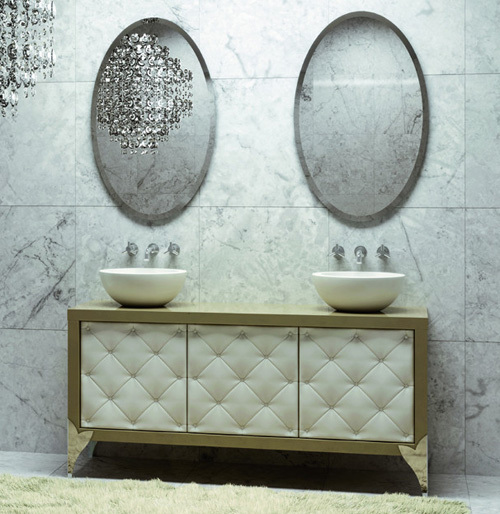 Featuring two egg-shaped washbasins in atramentous or white ceramic, the vanity anatomy is accessible in atramentous or white, with lacquered legs. For further inspiration check out Bizzotto.